Another week, another randomly chosen game from the itch.io firehose. This time around it’s A Flower from Hermes. So, after half an hour, how was it? 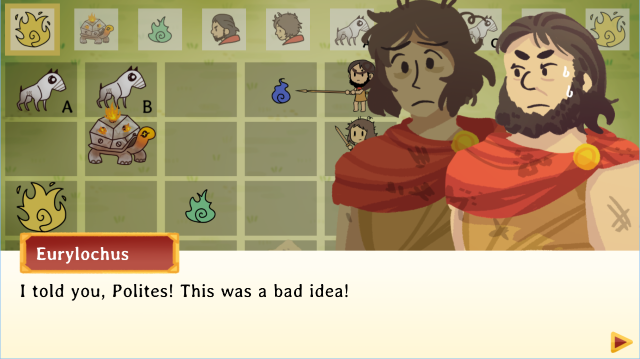 A Flower from Hermes is a top-down RPG from 3 Halves Games and is the result of the Odyssey Jam. They survived the Trojan War, the Cyclopes, the Man-Eating Giants, but trapped on an unknown island without food, can they survive each other? 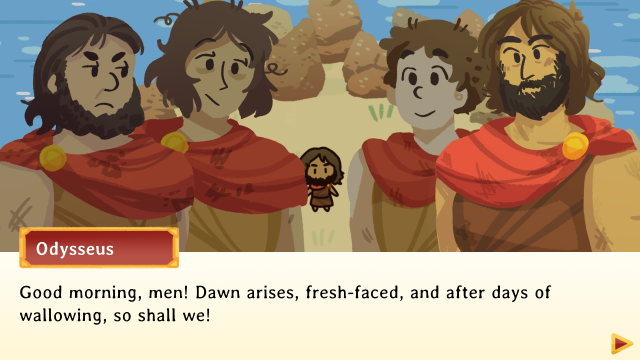 Help Odysseus and three high-maintenance crewmates overcome hunger and ego in this short RPG adventure. Fight with bronze weaponry, and wit against daemon-like monsters and one of the crew’s most dangerous threats yet. 3 Halves Games presents a video game adaptation of the Aeaean Saga from Book X of the Odyssey. ‘Short’ is right – it actually took slightly less than thirty minutes to finish the adventure, as befits a game jam entry. The version I played was 0.9, with 1.0 promised soon. It’s a nice little game with cute graphics and animation. The combat system is straightforward – your party faces off against the enemies on a square grid and take turns wailing on one another. As usual there’s some strategy in whether you switch weapons, what attack you use, who you prioritise and even whether you should simply run away. 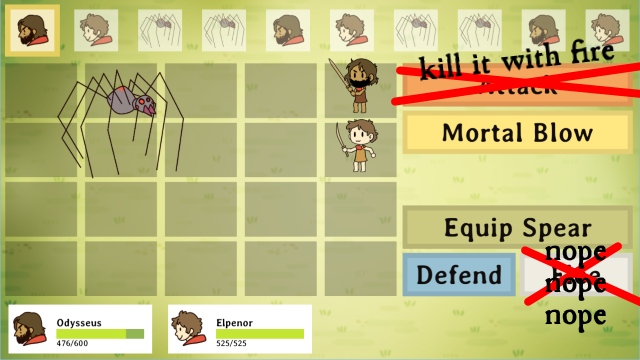 Obstacles can block enemies from some types of attack, complicating things but as it stands combat is mostly just switch weapon if needed and hit until everyone’s dead. However, it does all point to what the game could be if the developers chose to run with it beyond the jam. Expanded out to a full game A Flower from Hermes could be pretty compelling. It was made using the same engine for 3 Halves Games upcoming Eons Lost. Assuming A Flower from Hermes is even slightly representative of what Eons Lost might be, I’ll definitely be keeping an eye on it. Follow the devs on Twitter; the Eons Lost account too.